Truly delineating a series’ identity is a complex task. Like Dragon Quest’s slimes and 8-bit sound effects or Final Fantasy’s chocobos and Cids, Shin Megami Tensei has its own host of iconic characters and motifs, but the aspects that actually distinguish the series are an effect of the “punk” attitude mentioned by Kaneko. Alternatively, he explains, "the main point is that [SMT] is 'dark.' More than being actually 'gloomy,' it’s actually being able to say its story in a straightforward manner…show it with no dishonesty." Being “punk” means that SMT possesses a raw attitude unafraid to tear down established conventions. Japan's occult zeitgeist: 1980s titles like Teito Monogatari (left) and Wicked City (center) feature supernatural or demonic plots and were contemporaneous with the seminal Digital Devil Story: Megami Tensei novel (right). DDS: Megami Tensei's more varied use of mythic and folkloric figures and cyberpunk occultism separated itself from its peers. In practical terms, this meant either inverting the trends of early 1990s Japanese RPGs or completely eschewing them in favor of its own creativity. For example, while DQ and FF have fantasy worlds, SMT’s setting is a real city; whereas DQ and FF feature predestined heroes of legendary bloodlines, SMT’s casts are normal people thrust into extraordinary situations; it’s an RPG cliché to kill “god,” but only in SMT does the actual Judeo-Christian God appear. And that’s just to name a few. Shin Megami Tensei is a true multifaceted diamond in the rough, and the following traits best exemplify its character and essence. 1. Mythological and Religious Thematics. Shin Megami Tensei’s use of mythological and religious themes may very well be its nucleus, and only because the series treats the subjects with a great deal of respect. In the careful hands of staff members like former Atlus producer/director Cozy Okada, an acute understanding of these themes is incorporated into the games’ storylines, character arcs, and, of particular importance, the many demons themselves. While stories about religion or myth are not for everyone, remove them from SMT and you are left with Fallout by way of Dragon Quest—potentially great games, but in dire need of a new hook to stand out from the crowd. Many properties, video games or otherwise, use mythological figures or names, but none come even close to SMT’s usage or its truly worldly perspective, inclusive of beings from nearly every region on Earth. For instance, Final Fantasy summons like Shiva or Odin obviously crib their names from gods, but are otherwise meant to be original characters, whereas in SMT, the demons that bear those same names are meant to be the gods of human myths. Ironically, because of how central the demons and their portrayals are to the series, much of the content of a Shin Megami Tensei game can be defined as "unoriginal," i.e., composed of a plurality of images, material, and defining concepts from existing sources. Modern SMT games' demon profiles emphasize their origins. [Interviewer]: What was up with Hecate [at Yesod]*? Kaneko: That’s because she is the three-faced god. [Interviewer]: I was really impressed by this kind of proper symbolic explanation. When utilized correctly, demons are more than just monsters; proper understanding of their personal symbolism and mythological roles can reflect on the plot itself, telling a story within a story. "Gods, demons, and various events that are present in the series can be thought of as metaphors for real-life social structures. The main characters in these games employ demons to fight against powerful enemies. They mature as they overcome the anxieties and anger that they feel towards society. Resistance to society’s norms and growing out of adolescence… A hard rock interpretation of Pinocchio… That’s the basic style of Megami Tensei." Demons are visual metaphors for the many, often interpretive, things they individually represent, and it's these kernels of meaning which provide vital, defining substance to the whole series. Beyond a distinctive visual design, the aim of the Shin Megami Tensei main series is to portray the demons neutrally, without outside cultural bias or misinterpretation. This philosophy can be defined as a “collective interpretation,” which intends to reproduce how the original group of believers would have envisioned their local gods or demons, instead of the design being entirely at the artist’s whims or tainted by the biases of an outside group. 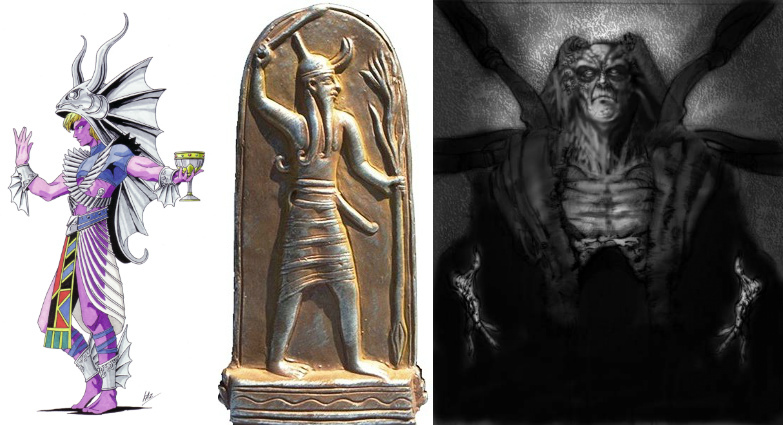 A perfect example is the Canaanite deity Baal; originally believed to be a heroic sky god in the mold of many others like Zeus, Thor, or Indra, in modern times he is better known for being demonized in the Old Testament. While just about anywhere in modern fiction the name “Baal” is attached to negative portrayals, SMT’s Baal fits the former, neutral description of a mighty benefactor. Truthfully, SMT doesn’t bat 1.000 even under Kaneko’s hand, but even some of the outliers have proven to be just an obscure passage or source image away from justification. If nothing else, Kaneko’s demon design philosophy is made of very deliberate choices, intentionally disregarding "cool-looking" superfluities that would detract from the essential meaning behind a demon. But because of the intimate relationship between SMT's themes and its visual design, this source-based, "collective" philosophy is more important than Kaneko's personal style; with proper understanding, anyone can design Shin Megami Tensei demons. It just so happens that, thus far, nobody does demons better than Kaneko. 3. Demon Mechanics (Races, Party Structure, Negotiation, and Fusion): Of course, Shin Megami Tensei is a video game series, not a book or art gallery. So if its demons are defined and illustrated as more than mere “monsters,” then this distinction must also be made within the series’ gameplay. Representing this need are gameplay mechanics that have been with the series since its Famicom debut: demon race classifications, an allied demon party structure, demon negotiation, and demon fusion. In essence, these mechanics are a translation of the mythological themes into gameplay: demons are sorted into races that act approximately as comparative orders of mythological archetypes; pacts like those seen in historical magical grimoires are formed as demons are negotiated with and summoned as allies; and fusion often creates logical results (ex. the Lady race [named "Earth Mother" in Japanese] is elementally upgraded in rank by Erthys or Gnome because of the earth associations of its demons). Though all have received tweaks and upgrades over the years, these fundamentals of demon rearing have remained constants. Races: With hundreds of demons in any given SMT game, it’s crucial to keep them organized in an intuitive way. As such, the primary purpose of races is to group demons by their approximations to actual mythological archetypes (groupings like “sky father,” the aforementioned “earth mother,” “trickster,” etc.). This affects other aspects of the gameplay as well, such as fusion results being determined by the races of the parent demons. Races can also signify alignments as, except for a few key exceptions, each corresponds to one of the Law/Neutral/Chaos triad and along the Light/Neutral/Dark affinity scale; this will impact negotiations in certain games, making races an at-a-glance tool. The value of races is such that they are pervasive across all Megami Tensei games and spinoffs, including Persona’s functionally identical Arcana classifications. In certain cases they may even have increased utility, such as the Raidou Kuzunoha series’ race-specific investigative abilities or Devil Survivor’s racial support skills. With just a few letters, demon races express multiple dimensions of information. Party structure: The vast majority of RPGs have battle parties comprised of their core casts of characters, so the concept of Shin Megami Tensei’s demon allies is different by default (though not entirely exclusive to SMT). SMT games do include human allies occasionally, but the majority always consists of the demons you recruit or fuse. Elevating demons to party members also justifies their thematic and narrative focus, in addition to being the mechanic the other gameplay elements revolve around, particularly negotiation and fusion. Negotiation: The primary function of demon negotiation is to recruit new allies, but it also has a number of secondary uses as well, such as ending battles in a truce or bartering for money or items. “Whenever you encounter a demon you’re unable to compete with, you can get them in good spirits through a conversation to avoid a battle. Of course, you can also befriend your opponent through demon conversation...Such high degree of freedom in a game is also something Megami Tensei-like, I think.”  This “freedom” of alternative outcomes adds another layer to Shin Megami Tensei’s battle system compared to other RPG series, where enemies tend to be mere fodder for heroes. 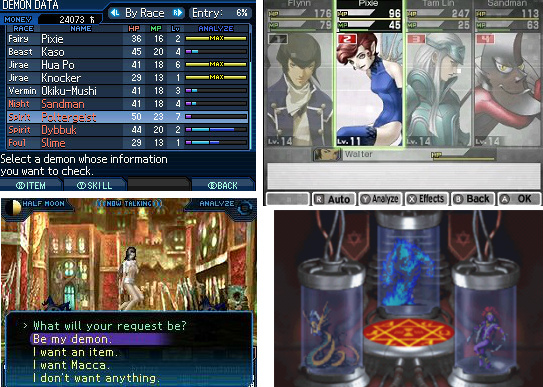 SMT spinoff series have experimented with different takes on the same concept, like Devil Survivor’s auction system which trades the multiple outcomes for guaranteed demon recruitment, but as far as the main series is concerned, the choices created by negotiation add the extra depth SMT needs to stand out. Fusion: Negotiation may be the method by which you increase your party ranks, but it’s only through demon fusion that you can customize them to your heart’s content or gain access to the strongest demons. Because either demons cannot level up in older games or don’t scale in effectiveness (compared to higher-level demons) even when newer games allow it, success in Shin Megami Tensei hinges on your willingness to part with your proselytized demons through fusion’s gradual incrementation. Even if you accrue useless demons or need to make room in your limited roster, by fusing, this fodder can potentially transform into something useful. It may be an unorthodox process of character progression, but fusion is nothing if not a trademark of the SMT series. Without these mechanics, Shin Megami Tensei’s gameplay would be simple and, honestly, pretty boring. They have not always represented technical ideals, but have also not been fearful of meaningful evolution that doesn’t leave their distinguishing qualities behind. But while successful interactive engagement is one thing, that the mechanics also reflect myths, archetypes, or rituals displays SMT’s deliberate thematic integration between its narrative and gameplay halves. An equally important function for SMT-style apocalypses is to set the “rules” of their settings, particularly in regards to demons and supernatural elements. Given the centrality of these metaphysical aspects, limiting factors are essential to maintaining suspension of disbelief, which the series tends to define in one of two ways: the "concrete" apocalypse and the "abstract" apocalypse. The concrete apocalypse is one that occurs in a clearly terrestrial setting where humans may still exist to some extent, beset by physical destructive causes like nuclear cataclysms or science gone awry; the obvious example of this type is the Tokyo of the first Shin Megami Tensei. In an abstract apocalypse, the setting is clearly extraterrestrial, whose native population is demons, not the humans who are mere “intruders”; examples of this include Shin Megami Tensei: Nocturne’s hallucinatory Vortex World or Strange Journey’s physically fluid and ethereal Schwarzwelt. Each type requires a different approach to its rulesets. A concrete apocalypse, since it is bound by human perspective and some semblance of tangibility, is a balancing act that needs just enough rationalization for demons to be plausible, but without excessive explanation that may cause internal contradictions or susceptibility to plotholes; in older SMT games, for example, this is accomplished sufficiently by having demons originate from an alternate dimension and manifest in the concrete space through an occult substance, magnetite. On the other hand, an abstract apocalypse is already playing by the “demonic” rules, requiring next to no justification (or magnetite) other than the initiating circumstances. Demons may be abstract by nature, but proper consideration can easily validate their existence. Lastly, the other important role of an apocalypse is to set the narrative tone. Given that the key word is "apocalypse," there is a certain expectation for how seriously SMT takes itself, so a consistent tone is crucial for its drama and choices to be effective. Maintaining a consistent seriousness is invariably tasked to SMT's central alignment characters, which is of utmost importance because, in such a high stakes situation, their experiences and opinions of the setting are what will inform the player's own choices, in addition to being the only ones with the opportunities to effect change in their worlds. They need to be able to “sell” the legitimacy of the situation to the player, in other words. But SMT isn't absolute grimness. It's common to find minor characters that provide comic relief or levity, but this usually comes at a personal cost: these characters are often "punished" with cruel fates or are made examples of to raise the stakes (ex. the protagonist's mother in SMT1, Daleth in Shin Megami Tensei II, Navarre in Shin Megami Tensei IV). In addition, demons provide a more natural, safer outlet for goofiness or humor. The series takes advantage of this particularly with the demon negotiations that are divorced from the main narrative. Since, by definition, demons are separate from reality, they have free rein to talk or joke about almost anything, from pop culture to the nature of existence itself. Considering some SMT games are light on story dialogue, these unpredictable, cheeky conversations might actually comprise the majority of a player's character interactions. While there's no need to be deadly serious at all times, defining appropriate limits to the usage of humor serves to keep the overall tone of the series consistent. 5. Choice: An especially iconic aspect of Shin Megami Tensei is its Law/Neutral/Chaos alignment system, and its child Light/Neutral/Dark affinities (for a total of nine true alignments). But behind that system is something more fundamental: choice. “What separates the Shin Megami Tensei series from most other Japanese RPG franchises is how often the player is called upon to make choices and offer opinions, which usually have significant effects on certain aspects of the storyline.”  These choices have profound effects on character and plot development, determining who allies with your party, who becomes your enemy, and branching ending paths, to name a few. SMT’s elements of choice provide the backbone of its dramatic tension, as the opposing philosophies of the Law/Neutral/Chaos dynamic erupt into conflicts of dominion over the fate of existence. In other words, pretty heavy stuff. “Even though humans are part of the universe, nobody knows why the universe exists, or how humans came into being. A philosophical approach is the only way we can reach some kind of conclusion. That’s exactly what myths are--philosophical explanations of the universe and man--and why I love myths so much. The demons in the Megami Tensei series all appear with these questions." Thus is the foundation of each alignment and its discrete features. Law’s inherent order offers safety within the primacy of a central group, at the cost of free will; its demon representatives are almost exclusively the pious angels of Abrahamic faiths. Conversely, Chaos stresses the importance of individual freedom, but under the shadow of a “might makes right” mantra wrought with extreme risk; Lucifer is the de facto leader of the Chaos demons, which may also include Buddhist obstructors. Between them stands Neutrality, which rejects the extremes of Law and Chaos in favor of a more reasonable balance of the virtues of each. As you might expect, the Law and Chaos camps don’t get along with one another, so whether the player aligns with one, the other, or neither is the most important decision in any SMT game. Okada: Simply calling it good and evil makes it easy to understand, but our games are not like that. Our concepts are on what we may call the same axis, not up or down, but on parallel lines. Choices and alignment conflicts are also at the heart of how the series handles characterization. The principal character in an SMT game is always its protagonist, whom is invariably of a silent disposition. One would think this would make characterization nonexistent, but this is actually a deliberate choice to give the player a vicarious experience and lend extra significance to his or her personal judgments. “[SMT] games are designed so that the player’s decisions as the protagonist determine the course of the story.”  “As you proceed through the story, the player is forced to make decisions, just as people do in real life when they come to crossroads. As a result, the biggest difference [between SMT and other RPGs] is that every player will create their own story.”  In Shin Megami Tensei, the player is both director and lead actor. Given the restrictions of SMT’s settings, character development for alignment heroes is basic but follows an effective formula, including comprehensible personal motivations (SMT1 examples: Law Hero’s search for his girlfriend; Chaos Hero’s wish for revenge against a bully) and arcs that are thematically apt (SMT1: Law Hero, killed in an attempt to save his girlfriend, reincarnates as a “chosen” messiah; Chaos Hero, seizing an opportunity for revenge, volunteers to fuse with a demon to gain power). Any backstory information given about a character will always support why they ultimately come to the conclusions they do, and will not reflect on the person they were before the apocalypse (unless that too has bearing on their choices). Topics that would lend personality to characters in other RPGs like favorite ice cream flavors, preferred comic books, or similar traits are simply irrelevant in SMT’s harsh environment. And those who do not ally, antagonize. The inevitability of Shin Megami Tensei is that the alignment heroes whose philosophies you reject will become "villains"; this concept of former friends turning heel and ultimately serving as fodder for the player's demons has become iconic of the series. The open-endedness inherent even in its antagonists is another key difference between SMT and other RPGs, whose central villains are fixed. Because it affects so much, player choice is inseparable from the series. It even trumps the Law/Neutral/Chaos ternary that usually gives it definition. How? Witness Shin Megami Tensei: Nocturne, which eschewed these trademark alignments for its proprietary "Reasons." Though Reasons function identically to alignments, the lack of typical labels allowed Nocturne to explore completely new philosophies. It was a bold message, but one the series would never repeat. Nevertheless, Nocturne's example illustrates that the basic concept of choice is one of Shin Megami Tensei's greatest traditions. 6. Tokyo. "The one virtue of [SMT] has to be the setting of battling in the streets of contemporary Tokyo, I think." There is no doubt of Tokyo’s centrality in Shin Megami Tensei. But is it genuine significance or mere solipsism? After all, main series games like Strange Journey proved that you can have an SMT game set outside of Tokyo without sacrificing the series’ spirit. The answer lies with what Tokyo represents: an archetypal metropolis. Kaneko: In the beginning, the conflict [in SMT1] was going to envelop the whole world. Okada: Right, right. We figured Tokyo would have been the starting point and it would have spread not only all over Japan but all over the world. A setting like Tokyo is also another way that set SMT apart from its Super Famicom competition. Compared to the original fantasy worlds of its RPG contemporaries, a real-world locale was a complete 180 degree turn. But even if Shin Megami Tensei may at times seem to over-rely on Tokyo, every game in the main series has its own unique spin on the city, whether it’s SMTII’s Tokyo Millennium or SMTIV’s subterranean Tokyo, so SMT can’t be entirely accused of resting on its laurels. 7. 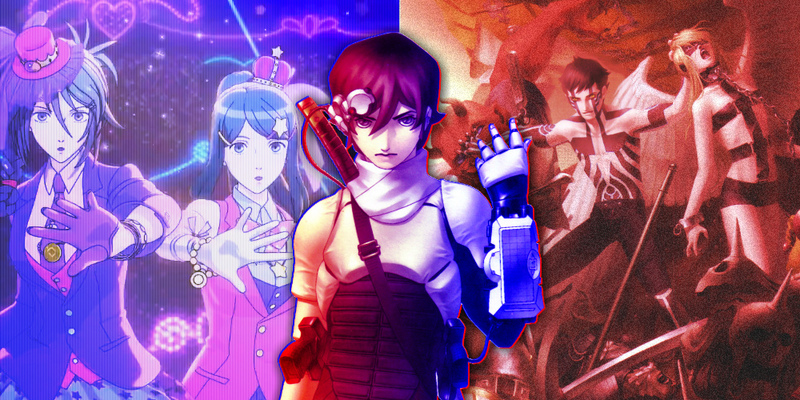 Miscellany: Naturally, there’s a more to Shin Megami Tensei’s appeal than just the six topics above. In fact, there is a whole legion of hitherto unmentioned recurring elements that nonetheless contribute greatly to the series’ personality. But are they as essential as those above? Jack Frost. The mascot of Atlus itself, of course Jack Frost and his brothers need mentioning. A Megami Tensei game without his trademark grin would be like a Final Fantasy game without a Chocobo, right? Similar to how Chocobos didn't appear until Final Fantasy II, there have been Megami Tensei games without Jack or his brothers, in particular Majin Tensei and Majin Tensei II, which are still considered part of the franchise. Jack is a star, but the show could (technically) go on without him. Difficulty. Shin Megami Tensei games have an imposing reputation gained from a perceived high difficulty level. After all, this is the home of punishing instant-kill attacks and insurmountable threshold guardians like the Matador. Shouldn't the bleak setting offer matching gameplay resistance to the player?In truth, SMT's general difficulty is highly subjective, though it would be more accurate to say that the series has a high learning curve. At first play, this curve comes from the prerequisite of absorbing systems and skill terminology completely alien compared to other games. But once knowledge of the series' tricks is retained, the tables turn and the difficulty is not significantly higher than other RPGs. Even the older games are not so much difficult as they are obtuse. But there is the obvious detail that, besides Strange Journey, every Megami Tensei game released on the PlayStation 2 and beyond has adopted a third-person view. Nevertheless, despite this different perspective, dungeon designs have largely remained twisted affairs with predilections for teleporter mazes, true to the sadistic spirit of the series' gridded map past. “True Goddess Reincarnation." The literal meaning of “Shin Megami Tensei.” Because it’s in the title, the idea of a reincarnating goddess is probably something you would expect to see in just about every game in the series. SMT games always feature central heroines and full rosters of goddesses, after all. Without needing to go into excruciating detail about each and every one, it can be assumed that these aspects and others like recurring soundtrack motifs, the Cathedral of Shadows, etc. provide a lot of character to Shin Megami Tensei. Still, even though they add character, they don't add depth, and that's why these aspects should be considered minor in comparison to the previous six. You can't build the foundation of a game series on mascot characters and camera perspective alone. Minor elements grow around the major ones, not vice versa—like the icing on a multi-layered cake. Of course, some people may very well prefer the icing to the layers underneath. Mythological themes: The focus on myths and demons can sometimes be so dense as to be impenetrable to those without outside knowledge of the subject. A game like Nocturne, whose thematics and subtext may overpower narrative transparency, could be perceived (inaccurately) as having no story at all. And, for overseas fans exclusively, the series' acute, Old Testament-based portrayals of Judeo-Christian mythological characters like Satan or YHVH may prove challenging and different than their modern preconceptions. Kaneko's art: As much as fans love Kaneko, his modern style is so distinctive that it can be confounding to those accustomed to industry standard anime aesthetics. Demon mechanics: Demon negotiation can be entirely random and frustrating, and the rules of fusion maddeningly opaque. As both are central gameplay mechanics, this could be considered a critical flaw. Post-apocalypses: A post-apocalypse, by nature, is bleak and depressing. It's far from an intrinsically alluring atmosphere or tone for what is ostensibly escapist entertainment. Choice (character development): SMT's particular method of ideological character development may make it seem that its characters have little personality at all. Tokyo: From an in-game navigational perspective, the locations of Tokyo's many wards may already be absorbed through cultural osmosis for Japanese players, but for non-Japanese, the matter-of-fact namedropping of places like Ikebukuro or Roppongi creates a confusing nightmare where they might as well be fantasy names instead. And even if there's a fresh spin on the city every game, Tokyo's constant reuse may seem stale and creatively restrictive. Fair criticisms like these may be why the series has remained niche. While Shin Megami Tensei's fans are incredibly loyal both inside and outside of Japan, such a narrow audience is no guarantee of survival. When asked about relatively low sales numbers in the US for Nocturne and Digital Devil Saga, Kaneko could only bluntly say, "Of course I want our games to sell more." So what was a franchise to do? Make friends instead of killing them. Shin Megami Tensei Character Profile: STEVEN REPORT. Kazuma Kaneko and Cozy Okada Interview. 1UP.com. (archived on Megatengaku) Devil Summoner: 1UP Interviews Artist Kazuma Kaneko. Kazuma Kaneko Digital Devil Saga Interview. Shin Megami Tensei II Staff Interview. Aish.com. Kabbala #21: Yesod: The Translator. 1UP.com. (archived on Megatengaku) Shin Megami Tensei Nocturne. Touch DS Creator's Voice. (archived on Megatengaku) Kazuma Kaneko. Escapistmagazine.com. (archived on Megatengaku) Behind-the-Scenes of Shin Megami Tensei. Nintendo Power, vol. 251. The Demon Whisperer. Cole Lastie. Shin Megami Tensei: Law, Chaos, and the American Way. Shin Megami Tensei Fanbook Interview. Fred Gettings. Dictionary of Demons. Guild Publishing, 1988.